@Kathy Morris: Thanks, Kathy. Fixed the text. Nice work. FYI- there are actually four people in this image. 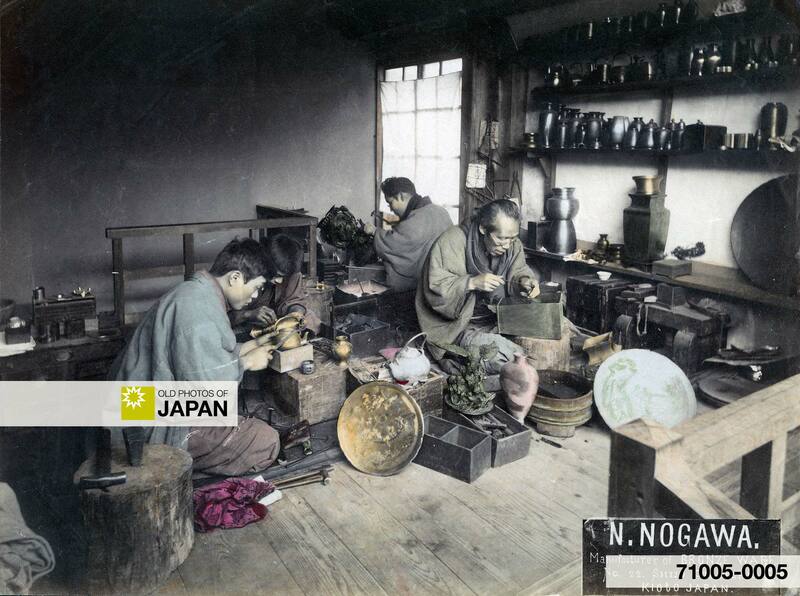 Four bronze ware craftsmen are at work in the workshop of Noboru Nogawa (能川登) in Kyoto, founded in 1825 (Bunsei 8). Nogawa acted both as a manufacturer and dealer and ran a very popular shop on 35 Shijo Otabicho, as well as showrooms in the Kyoto Hotel and the Miyako Hotel, the city’s most exclusive hotels. Although there is surprisingly little documentation on the company, it appears to have been well-known at the time. It exhibited at several large overseas exhibitions between 1893 (Meiji 26) and 1910 (Meiji 43) and the Kyoto shop was listed in A Handbook for Travellers in Japan written by the famous British Japanologist Basil Hall Chamberlain (1850–1935) and telecommunications specialist William B. Mason (1853-1923). First published in 1889 (Meiji 22), this was for decades the most authoritative English language guide on Japan. In advertising, the company introduced itself as “a manufacturer of bronze and fine art wares,” which included garden items, birds, animals, human figures, Buddhas, gongs and bells, vases, lanterns and small pieces. Nogawa also sold cloisonné ware, damascene works, ivory carving, lacquer ware, pearls, prints and Satsuma ware.1 The image on the left shows a Buddha statue that was recently sold at auction and came with a receipt from the Nogawa company. These kind of items were very much loved by foreign visitors who bought trunk loads of them. Because of the lack of documentation, until recently Nogawa metalwork was identified as being from the Hattori Co. It was only during the early 2000s that experts discovered that the distinctive mark they had believed as belonging to Hattori, was actually Nogawa’s trade-mark. It features the stylized hiragana character no (の) with three vertical lines in the background signifying the kanji character for river (川, kawa, or gawa in compounds). This is effectively pronounced as Nogawa.2 This new discovery meant a drastic evaluation of Nogawa’s small but productive workshop. Undoubtedly, as a result more Nogawa pieces will be discovered in the future. It is truly fascinating to realize that all over the world are beautiful items bearing this mark —a mark often probably even unknown to the current owner— and that they were all made in the small workshop shown in the above photograph, maybe even by one of these four men. 1 Schneider, Fredic T (Winter 2004). Meiji Japan’s Hattori Co. no more. N. Nogawa Bronze Company and its Mark., Daruma, Japanese Art & Antiques Magazine, Issue 40: 46-47. You can also licence this image online: 71005-0005 @ MeijiShowa.com. 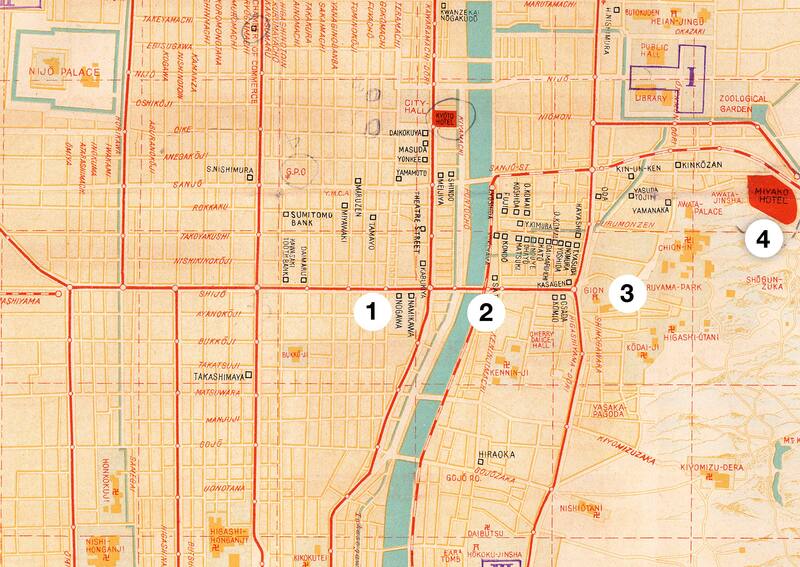 The N. Nogawa shop at the same address was still in operation as late as November 1935. A British tourist picked up a card from the store in that month. Thanks, Michael. I have also seen N. Nogawa receipts for the 1930s. I haven’t seen anything yet from after the 30s, though. Do you recall anything about the Buddha figure you posted an image of? I have a similar one that was brought by my family from Japan in the 1930s. They lived in Kobe and I had always thought it was from there, but appears identical to the photograph. Unfortunately Buddha statues are outside my area of expertise, so I highly recommend contacting someone with knowledge of them. Incidentally, Buddha statues like these are not really rare; having a contemporary invoice or receipt can make a big difference. You’re welcome, Mike. I just had a look at the photo that you shot of your Buddha statue. It is a beautiful minimalist shot; I love how you angled your shot and how you included the tree trunk. It actually looks like it is a huge statue on a mountain. I see that you are based in London, Ontario. Spent a month in the Waterloo-Kitchener area in 2000, and also visited London at the time. Really loved it there. Thanks for your help I found a Nogawa vase in a dump 38 years ago. Hello…literally today I found a miniature bronze vase with 3 cranes standing in water with a few reeds that bears the makers mark as shown above for $1.25. How can I find out if it is real? I am afraid that I don’t know where you can find an appraiser familiar with Nogawa’s work. You could try contacting Kogire-kai.